Saw this article on Fishing Wire and wanted to share with you. New Braid by Power Pro. Got to get some and try it out. GRAND JUNCTION, Colo. -- Re-engineered with added abrasion toughness so anglers can rip through the heaviest cover with the same force as standard four-end braids, the new PowerPro Super8Slick V2 braided fishing line combines a new eight-end dense weave fiber construction with proven ‘Enhanced Body Technology’ (EBT) process. The new braid is offered in nine different pound test designations, and in five spool sizes to fill from one reel, to bulk spools for multiple fills and for reel spooling by your local tackle shop. 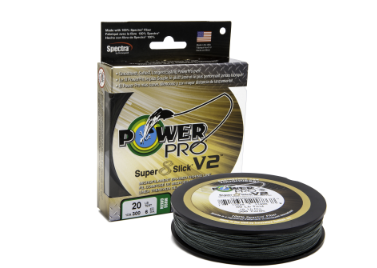 For more information on the new PowerPro Super8Slick V2 from Innovative Textiles - a Shimano Company, see your local tackle dealer, visit PowerPro.com on the web, or call PowerPro customer service at 877/577-0600.